Andres Fleitas, one of the oldest living players from the Cuban Baseball League, passed away December 18, 2011 in Miami. He was 95. Fleitas was a catcher and first baseman who went pro in Cuba during the 1942-43 winter league season. His performance attracted the attention of major league scouts, and he was signed to the New York Giants organization. After playing two years at the AAA level, he was lured by the large coffers of Mexican owner Jorge Pasquel, and spent three years in the Mexican League. This put him on the banned list by commissioner Happy Chandler, and when the ban was lifted, Fleitas still carried the stigma of playing in the outlaw league. 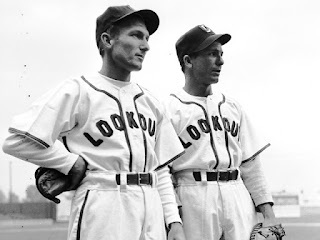 He continued to play in the minor leagues through 1954, even getting the opportunity to play with his brother Angel in Chattanooga in the late 1940s (see above photo).